It’s finally soup season, and this Creamy Chicken and Gnocchi Soup is perfect for the cooler weather coming our way! This soup, much like my Zuppa Toscana, is based on one served at the Olive Garden, but once you make it at home I think you’ll be sold on staying in! The base of this Creamy Chicken and Gnocchi Soup is super rich and creamy and with the chicken, vegetables and soft, pillowy gnocchi, I found a cup of this soup to be super filling. I love pairing a decadent soup like this with a side salad, it makes for a perfect fall or winter lunch or light dinner. If you already love my Creamy Chicken and Wild Rice Soup (and I know many of you do), this soup uses the same technique to get the smooth, creamy texture and it tastes just as good. 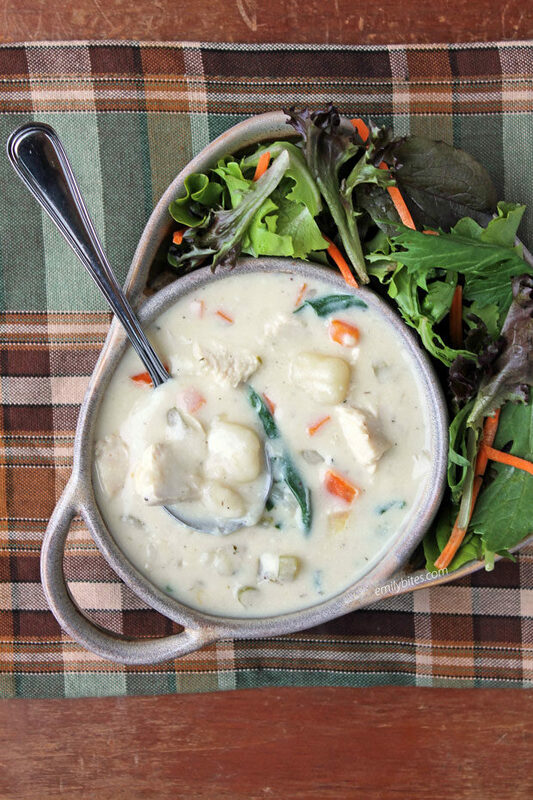 Better still, one cup of this Creamy Chicken and Gnocchi Soup is just 227 calories or 5 WW Freestyle SmartPoints! 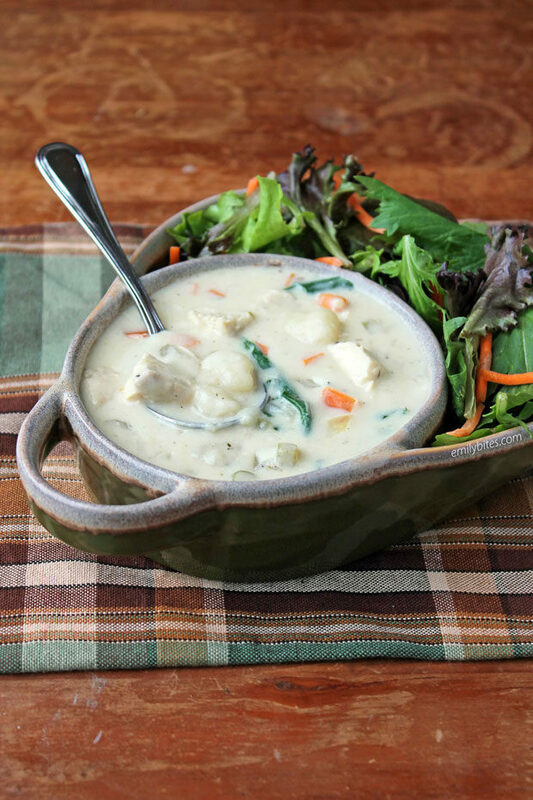 For more tasty, lightened up soup recipes like this Creamy Chicken and Gnocchi Soup, check out my Sausage and Tortellini Tomato Soup, Butternut Squash Soup, Creamy Chicken and Wild Rice Soup, Roasted Corn Soup, Beef Taco Soup, Buffalo Chicken Soup, Slow Cooker Beef and Barley Soup, Chicken Corn Chowder, Zuppa Toscana, Broccoli Cheddar Soup, Italian Wedding Soup, Cheeseburger Soup, Spaghetti and Meatball Soup, Chicken Tortilla Soup, Herbed Chicken and Dumplings, Roasted Tomato Basil Soup and more in the soup section of my recipe index! Heat the oil in a dutch oven or soup pot to medium heat. Add the onions and garlic and stir to coat. Cook for 3-5 minutes until the onions are softened. Add the broth and water and increase the heat to bring the contents to a boil. Add the chicken breasts, carrots, celery, rosemary, thyme and nutmeg and once bubbling again, reduce the heat to a simmer and cover. Simmer, covered, for 25-30 minutes until the chicken breasts are cooked through and the vegetables are tender. About 10 minutes before the chicken is done simmering, mix together the flour, salt and pepper in a small dish. Melt the butter in a medium saucepan over medium heat. Slowly whisk in the flour a little at a time until fully combined and let the “paste” that forms cook for 1-2 minutes. Slowly whisk in the half-and-half a little at a time until the mixture is completely combined, smooth and creamy. Cook for another few minutes, whisking occasionally, until the mixture thickens and lightly bubbles. Remove from heat. When the chicken from step one is finished cooking, remove it to a cutting board (recover the pot and continue to simmer the other ingredients). Chop the chicken into bite-sized pieces and set aside. Uncover the simmering pot and add the gnocchi to the broth and vegetables. Re-cover and simmer for the time listed on the package of gnocchi (likely somewhere between 2-5 minutes). Uncover and whisk or stir in the creamy mixture from step two until well combined. Add the chopped chicken and the spinach to the pot and stir to combine. Cook, stirring, for another 2-3 minutes until spinach is wilted. Add salt and pepper to taste if desired. Serve warm. Where did you get that cute soup and salad in one dish? Thanks again for another great recipe! I can’t wait to make this! Your creamy chicken and wild rice soup is already one of my favorites! Question: Is the gnocchi you use frozen? The gnocchi I used is not frozen, it is shelf stable and found in the pasta aisle. I definitely think you could use frozen though if that’s what you have! Hi! What size dutch oven do you use? I’m single and like to make enough to freeze into portions but don’t have a large family to feed. Wasn’t sure if I should look for a certain size. This looks wonderful! !Do you think this could be made in a instant pot? I made it in the IP! Im making it again right now, but ugh I can’t remember how long I put it in for! I think only like 5 or 6 mins after combining everything but the flour mixture! I made some adjustments, I used oregano, salt, pepper, red crushed pepper, and garlic salt for seasoning in lieu of Thyme and Rosemary. But let me tell you what…. THIS WAS INCREDIBLE. The recipe plus the execution delivered results. Perfect for fall/winter and was filling, creamy, and fantastic. Very tasty! I didn’t have any nutmeg so I omitted it. It did taste a bit like it was missing something, but I suspect the lack of nutmeg was to blame, which was completely my fault. In spite of that, it was creamy, comforting, and delicious. Thanks for the great recipe! This soup is unreal!! Made it last night. It tastes amazing and is so filling. Thank you! This soup is so delicious! My whole family (three-year-old included) loved it. This is delicious. My family asked me to add it to the regular rotation. My teenager said it was in his top three favorite meals I’ve ever made. Yum! Has anyone tried to make this in the crockpot? Thank you for the great recipes! Absolutely delish! Followed the instructions and it came out so stinkin’ well! And it makes so many servings!! Definitely adding to my normal rotation. Holy yum!!! My husband and I LOVED this soup. Great instructions, easy to make, and excellent results. I had some peas and bacon that needed to be used up and they were a great addition. We will definitely make it again. Thank you!!! This dish is amazing! I coilsnt believe how rich and creamy it was! And the flavors were off the wall! I told everyobe about it. Thisnis becoming a staple in my house. Do you have any suggestions if you cannot find the light sticks of butter? Our store used to carry them and now they do not and I am at a loss because I am in love with all of your soups that use this. It comes to 7 freestyle points.